Willow Tree "The Christmas Story"
Willow Tree "The Christmas Story Sanctuary"
The design of the Sanctuary is based on historical architecture. Its gothic arches symbolize protective havens in which people throughout the ages have gathered to seek inspiration and hope. The two sides and center panel form a ‘triptych’ – traditionally, a work of art in three panels. 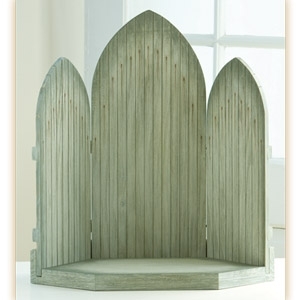 The pieces are constructed of wood, hand-painted and sanded for a distinctive finish. Rusted nail holes provide a decorative linear element, and are a metaphor foretelling the crucifixion. 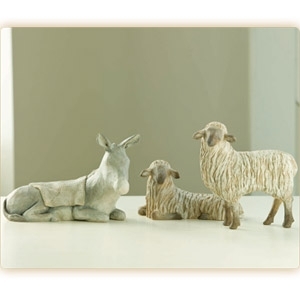 Willow Tree "The Christmas Story Animals"
Gentle Animals of the Stable - these animals have a calming, yet very stoic, elegant presence – by their gestures, their stance, the turn of their heads. The color and texture give them a softness, indicating wooly or furry, or in the case of the donkey, the clothlike surface of a blanket. 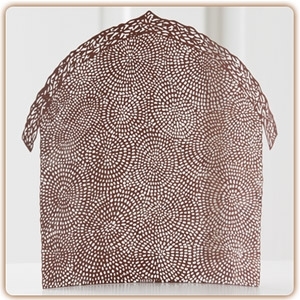 This pierced-metal backdrop was created to complement The Holy Family, though it can be used as a beautiful backdrop for other angels or figures as well. A child is born. 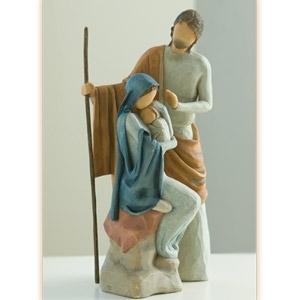 In response to requests for a small-scale nativity, Susan created this intimate rendering, measuring 7.5" tall. 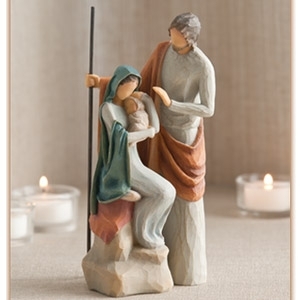 This one-piece sculpture is ideal for those with limited display space, or who wish to display a nativity year-round.